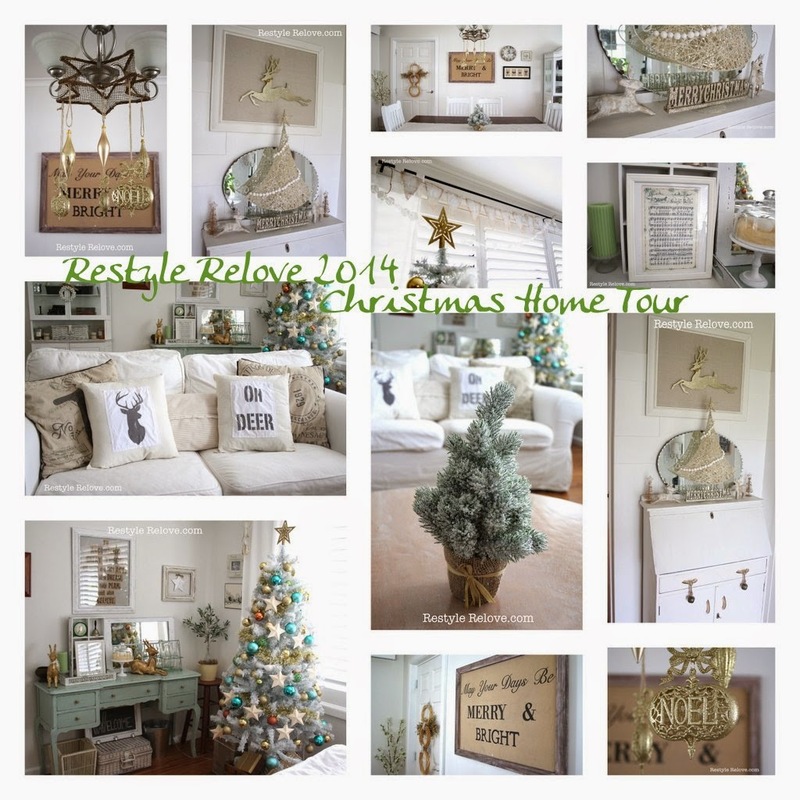 Welcome to my 2014 Christmas Home Tour! This year I went with a white and gold theme in the entryway. This cute little sign I made last year. I continued the white and gold theme into the lounge room, and add some pops of aqua on our tree. I got this little flocked tree last year. Isn't it just the cutest thing ever. These are my "Oh Deer" cushions I made last year. I love our white tree. The cardboard stars I made a few years ago. The only expense was the aqua baubles. The burlap Christmas banner I also made a few years ago. And I also made the doily garland. I also hung music sheet paper chains to create some festivity. I tried to keep a lot of my usual decor, and just add a few decorative pieces. I framed this old music sheet of Jingle Bells. I love old sheet music. I hung a small decorative bell wreath from the glass display cabinet. Another cute piece I picked up on sale last year. The ribbon tree I made a few years ago and it is also a favourite piece. And I couldn't forget the kids annual Santa photo. The dining room continues the gold theme. The large sign I made and have since restyled it with white writing. And the angel I made out of some thrifted wreaths and decorations. I loved my little flocked tree that I bought two! This one is a bit bigger. The chandelier got a Christmas makeover using a star shaped basket that I attached and then adorned with Christmas decorations tied on with twine. I've got a few more Christmasy projects on the list I can't wait to share with you all. Boy you are way ahead of me. Looks festive at your home! Your home looks lovely! I haven't even thought of starting to decorate for Christmas yet...nothing goes up here until December 1st - thanks for the inspiration! Loved the house tour and your look for Christmas is what I think I want to go for too this year. Love the Oh Deer pillow! I love your style! Definitely inspires me for our decorations this year. We just bought a new house, so I'm sure my current decor will be stretched thin....maybe a good time to re-stock? Anyway, it looks beautiful! Everything is beautifully styled and oh,so lovely. Love the welcoming pillows on the sofa. So romantic place! Thanks for sharing! Wow, I just found your blog via the Inspire Me Please linky party and I just love your style! I'm a new follower! Sparkles,Glitter, Vintage treasures & rustic chic charm...AMAZING!! <3 EVERYTHING ! Everything is absolutely stunning! You are so far ahead of me, I'll be lucky to get this far at all, lol. Thank you so much for sharing your home at Vintage Inspiration Party. I love your Christmas tour! Soooo pretty! I hope you will share it tonight at the Found & Foraged party! It starts at 8PM CST. Can't wait to see you there www.thebigrevealblog.com! Very beautiful, Julie. Such a pretty color scheme. Have a wonderful holiday season! julie, your home looks beautiful! i love the aqua touches on your tree! Julie this is BEAUIFUL! We LOVE everything about it, especially the pillows! Great job!